Ok, so like this game was like, SOOOOOOO AWESOME! OMG! Like, did you see when the Habs fans jeered Carey Price? Like, Omigod! I don't even care about the goals. They're all here. For the whiners: Kessel was totally offsides and it was awesome. Tim Thomas played shutout hockey for the last 59:21 seconds of the game. Is it even warm enough to be golfing near Montreal right now? Ok, Bruins earned a little time off. No practice on thursday. Gotta remember: STAY HUNGRY! More on this on Friday. It's going to be good. Different Bat-Time, Same Bat-Channel. I kept thinking that Kessel was offsides too, even rewound it several times. I bet the refs told the linesmen to let them play so they could get done and off the ice before the Bell Centre roof flew off and the souls of the dead Habs came through to eat all the current players...sort of similar to the final scene in "End of Days". GREAT GAME, GREAT SERIES. I am so goddamn excited to see who they face next and how far they'll go. Everyone is on their game right now and it's amazing to see. GO B'S!!!! Kessel was cracking up on the bench because he knew he got away with one. Good for him. 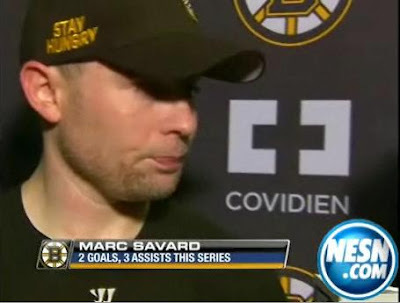 I am so happy that the Bruins advanced to the second round, it has been a long time. 1998-1999. I hate the habs and it was good to see the Bruins put the finishing touches on them in the Bell Center.